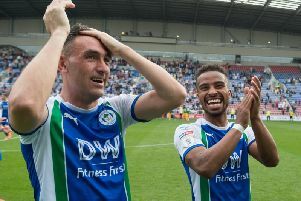 Callum McManaman has been earmarked as Wigan Athletic’s dangerman ahead of this weekend’s visit of West Brom – by a man who knows what he’s talking about! Baggies assistant manager Graeme Jones makes his first return to the DW Stadium since leaving in 2013 after delivering the FA Cup alongside Roberto Martinez. Man of the match that day at Wembley was Callum McManaman, and Jones admits he’ll be giving the West Brom defence a special briefing when it comes to dealing with the threat of the 27-year-old. “As long as Callum doesn’t play as well as he did at Wembley, I’d be delighted!” Jones told the Wigan Post. “He’s such a special player, and you have to really understand him and what it takes to get that extra five per cent that makes him so special. “He has to train right, get minutes on the football pitch...you need to build him up. “There was so much work that went into Callum – I’d say a good three or four years – to get the results we saw in the last 16 weeks of the season, which of course culminated in the FA Cup win. “It just showed that when he puts his mind to it, and he’s understood from a managerial point of view, what he is capable of. “He’s a special player who deserves special treatment to get the best out of him, and people around him who understand him. He’s a unique player...he doesn’t get to a certain level at the same rate as other players. McManaman is pushing for a start at the weekend having impressed off the bench during his late cameo in the 4-0 defeat at Preston before the international break.